Using a meat mallet, pound the steaks to about 1/4 inch in thickness. 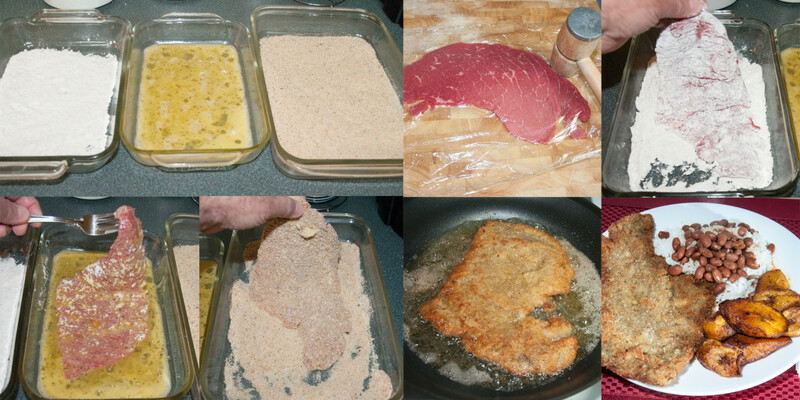 Set up three bowls for breading your steaks. In the first bowl add your flour and a tablespoon of my adobo mix (mix well). In the second bowl add your eggs and about a tablespoon of water and beat the eggs. In the third bowl add the breadcrumbs and a tablespoon of my abodo mix (mix well). Dredge in the flour first, then dip floured steak into the egg mixture, then dip into the breadcrumb mixture, coating well on both sides. Heat a frying pan and add the canola oil. Fry for just a minute on each side (enough to brown the coating on both sides. Remove from pan and place on paper towels for a minute. 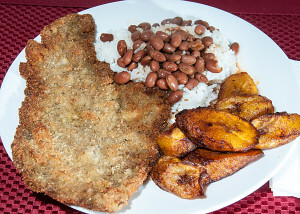 Serve over white rice, beans and sweet plantains.